For other people named Richard Kirby, see Richard Kirby (disambiguation). Kirby's Formation (2003) stands on the entrance to the Ravenswood housing estate in Ipswich, Suffolk. It is inspired by a Second World War poster depicting aircraft flying in close formation being tracked by searchlights. Rick Kirby (born 1952) is an English sculptor born in Gillingham, Kent. He started his career as an art teacher, before quitting after sixteen years to focus on his work. Much of his work is figural, reflecting an interest in the human face and form, and is primarily in steel, which he describes as giving a scale and "whoom-factor" not possible with other mediums. Kirby was born in 1952 into a naval family. He was interested in art as a child, and went on to study it after high school. From 1969 to 1970 he studied at the Somerset College of Art, and from 1970 to 1973 at the Newport College Of Art, from which he received a Bachelor of Fine Arts. This education was both liberating and confusing, he said, and left him without an idea for the direction of his work. From 1973 to 1974 he therefore studied towards an Art Teacher's Diploma at the University of Birmingham, and spent the next sixteen years teaching art. During his time as a teacher Kirby's own artistic sense bent towards sculpture, and after sixteen years he quit teaching to focus on his work. For the next three years he sculpted in stone, before a steel-working co-tenant asked him to try out his welder. "Steel released me," as Kirby put it. "It gave me the ability to go huge, a scale that just is not possible with stone": a "whoom-factor!". As he described it, "it is the juxtaposition of steel in its raw form, cold-industrial, and the warm-human that my art breathes into it – that is my fascination." Kirby's oeuvre is largely figural, reflecting a fascination with the human face and form that has persisted since his time working in stone. Though he uses an industrial medium in steel, Kirby's pieces are intended to express elegance and grace, and guardianship; a reviewer of one of his exhibitions noted that "they do not dominate their settings, but instead calmly watch over their environment with an air of gentle theatricality." Most of Kirby's pieces are public commissions, and are therefore monumental in size. 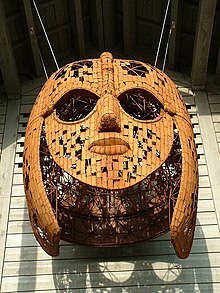 His pieces range in height from one to ten metres; his 2002 sculpture Sutton Hoo Helmet, modeled after the Anglo-Saxon Sutton Hoo helmet from the Sutton Hoo ship-burial and unveiled by Nobel laureate Seamus Heaney, is 1.8 metres (5 ft 11 in) tall and 1.6 metres (5 ft 3 in) deep, and weighs 900 kilograms (2,000 lb). Several of Kirby's pieces are displayed in the Palace of Westminster in London, and in Putney along the banks of the River Thames. His works have been unveiled by Queen Elizabeth II, Princess Margaret, and Prince Edward. When unveiling When the Sky's the Limit the Spirits Soar in 2005, Prince Edward remarked that "I don't know quite what the word is. It seems to represent something going upwards." ^ Hong Kong Art Tutoring 2013. ^ a b c d Bath Contemporary. ^ a b c d e f g h i ArtParkS. ^ a b Rick Kirby cv. ^ a b Marcelle Joseph 2012. ^ a b Hope 2017, p. 44. ^ a b Cocke 2009. ^ Wiltshire Gazette & Herald 2002. ^ a b Morton 2005. ^ a b Hoggard 2000. ^ Public Art Port Marine. ^ Essex Chronicle Series 2005. ^ Qureshi, Yakub (19 April 2010). "Wigan's angel of the north". Retrieved 2 February 2018. ^ Quality of Place awards 2017. Wikimedia Commons has media related to Rick Kirby. "2017 Quality of Place Award Winners". Suffolk Coastal and Waveney District Councils. 2017. Retrieved 25 February 2018. "Aerial Art: Metal 'Angels' Look Out Over Portishead's New Development". The Independent. London. 1 June 2002. p. 7. "Amazing Art or Awful Eyesore?". The Wiltshire Gazette & Herald. 17 January 2002. Retrieved 24 February 2018. "Angels of Portishead". Public Art Port Marine. Retrieved 25 February 2018. "Artist of the Week – Rick Kirby". Hong Kong Art Tutoring. 18 February 2013. Retrieved 3 January 2018. Cornwell, Richard (25 November 2017). "Woodbridge 'Hands' and Felixstowe's Bartlet scoop awards for improving area's quality". Ipswich Star. Retrieved 24 February 2018. Hoggard, Liz (15 October 2000). "The Enchanted Forest". The Independent. London. pp. 48–51. Retrieved 24 February 2018. Hope, Jessica (June 2017). "His Implacable Gaze: Sculptor Rick Kirby at Bath Contemporary" (PDF). The Bath Magazine: 44–45. Kirby, Rick. "Rick Kirby – Curriculum Vitae". Rick Kirby Sculpture. Retrieved 3 January 2018. Lonsdale, Sarah (27 July 2002). "A New Start for the Art in Residence". The Daily Telegraph. London. p. 7. Morton, Owen (31 March 2005). "Inspiring Attitude Captured in Art". Sevenoaks Chronicle. Sevenoaks. p. 9. "Rick Kirby". Bath Contemporary. Archived from the original on 11 October 2015. "Rick Kirby at the Oakley Court 2012" (PDF). Marcelle Joseph. 2012. Retrieved 24 February 2018. "Rick Kirby Sculptor Profile". ArtParkS International. Retrieved 3 January 2018. "Sculpture Makes Every Passer-by the Face of Wigan". The Times. London. 13 December 2008. p. 28. Retrieved 25 February 2018. "The Story of The Hands". Woodbridge Quay Church. Retrieved 24 February 2018. "Sutton Hoo attraction moves closer". Ipswich Star. 26 February 2002. Retrieved 3 January 2018. "Work Unveiled". Essex Chronicle Series. Essex. 10 February 2005. p. 5. Julia Stubbs, an Advanced Skills Teacher in Art & Design at William de Ferrers School, Essex.